Wiley CIAexcel 2019: Latest Pros & Cons & Big Discounts - Legit Codes! Wiley CIA Review (Wiley CIAexcel) is one of the major providers for the Certified Internal Auditor exam. At this time, Wiley doesn’t have an offering with videos, audio lectures, or individualized coaching/support. If you feel like these features are instrumental for you in order to pass the CIA exam, you may want to check out Gleim CIA Review. If you are a stronger exam candidate or are only looking for a supplement, this option may be perfect, so let’s get started! 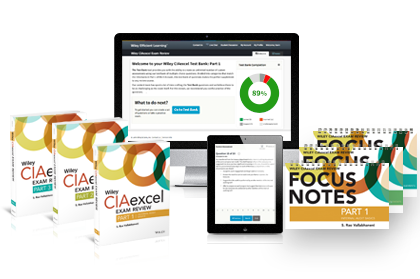 Save big on your Wiley CIAexcel Study Materials with this Wiley CIA discount. What’s Included in the Wiley CIA Review Course? There are 3 books altogether in this set: Part 1, 2 and 3 respectively. Each book begins with an introductory chapter covering exam format and basic study tips. The subsequent chapters cover the domains in accordance to the CIA exam content specification (i.e., the syllabus). The exam itself is primarily theoretical. In Parts 1 and 2 in particular, there are rarely computational questions. Therefore, expect to see a book full of text. Wiley does try to make things easier by using subheadings, bullet points and highlight boxes as much as possible. At the end of each chapter, there are a handful of sample questions for your review. There are more than 5,300 multiple choice questions, with other helpful features such as the ability to flag the questions you would like to pay special attention at a later date, as well as tracking of your performance with charts and statistics. It runs on the same platform as the Wiley CPA Test Bank. The notes are designed as a supplement to review materials from Wiley or other providers. The chapters included in the Focus Notes are in line with Wiley, but the content doesn’t match page by page. It is a great material for final review. Wiley has one of the most established and reputable brand names in the accounting and finance exam prep industry. The Wiley CPA book is the most popular and best-selling offering for the CPA Exam. The Wiley CMA review book is officially endorsed by the IMA. And finally, the Wiley CFA review course is the up-and-coming product second to Kaplan Schweser notes in terms of popularity. The CIA review material is not a best-seller (yet), but please be assured that the team behind the product is pretty strong. I have a handful of readers who actually prefer Wiley’s CIA test bank over Gleim. Because some readers site that Wiley CIA Review better prepares them for the actual CIA exam, I’ve started to recommend using Wiley, in addition to Gleim, if someone is having a real problem clearing the exam. Wiley CIA Review has a free trial, and it is a relatively new introduction. You get to try it out for 2 days. This timeframe seems short, but it’s enough to make a decision in my opinion. So make sure you pick a relatively relaxed day, spend an hour to really dig into the features, and make a decision. You should also test the free trial of other providers at the same time. Gleim is the only other one for now. In an attempt to enter the CIA exam prep market, Wiley is willing to offer big discounts, for now. The standard Study Pack for Part 1, 2 and 3 is only $375, and occasionally there are discounts up to $100. What Do You Think About Wiley CIA Review (CIAexcel)? Leave a comment on this post to let us know! I got Wiley (3 parts) text book (2014 edition) & Gleim Test Prepartion question (3 parts) (with approximately over 3,000 questions) ( 16th edition) on hand. I am going to attend 2015 CIA (all 3 parts) exam in one shot. Do you think it’s necessary for me to be equipped with Wiley test bank as well? How do you find it? I found that t Gleim (16th edition) questions did not cover full syllbus listed as per Wiley’s text book. Urgently to seek for your kind advice. My readers seem to be pretty ok with Gleim alone. The review course providers have different interpretation of the syllabus and what’s heavily tested or not, so I wouldn’t worry too much of the difference. Just focus on the practice questions that you have, do an excellent job (achieve at least 85-90%), and redo the once you did wrong previously, you will be fine. Thanks a lot Stephanie for your prompt response & kind advice. Do you think there are indeed a lot of difference between 16th & 17th edition? I am afraid there will be great portion of duplicate questions. Would you recommend me to get the 17th edition full set of Gleim materials? I would like to know about which course do you recommend to study to take CIA certification?? Hello – Do you know what the difference is between Wiley CIAexcel and Wiley Efficient Learning? Which one would you say has the larger or more difficult test bank? How similar are Wiley practice exam questions to the actual CIA questions? Also, I felt that the Wiley study material does not fully equip you for its practice questions.. what do you think about this? Please email stephanie[at]ipasstheciaexam.com so Stephanie can help you with this.